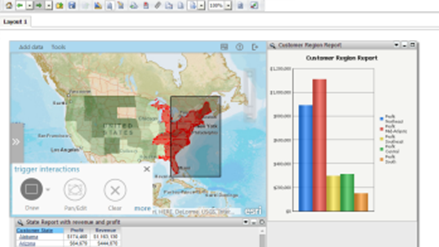 Esri Maps for MicroStrategy lets you create rich, dynamic maps that interact with other datasets in your documents and reports. Note: Esri Maps for MicroStrategy has been retired effective February 01, 2019 [PDF] and is no longer available for download. If you have already downloaded Esri Maps for MicroStrategy you can continue to use it. Read more about its product lifecycle support status. 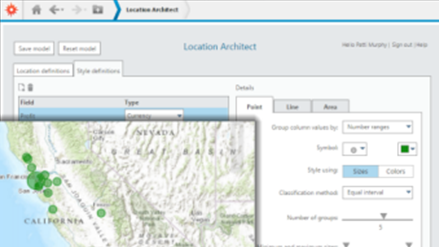 Create rich maps that meet corporate style standards in just a few clicks using Location Architect. 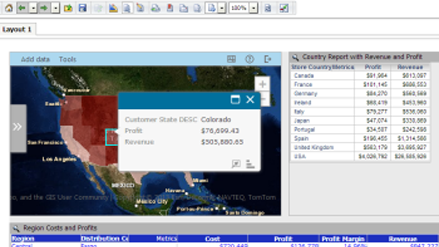 Add interactivity between datasets in your document by configuring your map as a selector or as a target of a selector. 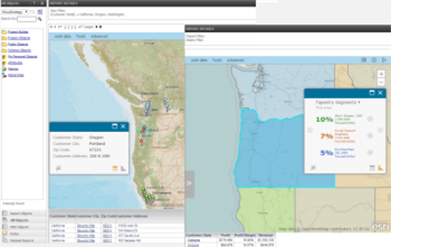 Add a dynamic Esri map to your MicroStrategy Web report to help you make better business decisions. Enhance your dashboard with one or more interactive maps to visualize your MicroStrategy data in new ways. Find and complete exercises that solve real-world problems with ArcGIS. Learn more about ArcGIS through instructor-led courses, web courses, and seminars. Contact Esri Support by chat, email, or telephone. See the status of ArcGIS Online and report issues.